We are delighted to invite you to a collection of work by Stephen Palmer focusing on the Sussex countryside and the Ile de Ré. 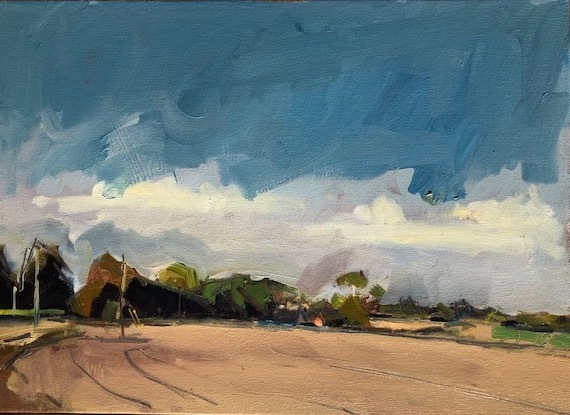 Stephen paints en plein air and has produced some subtle studies of Petworth and its surroundings. He captures the green sweeps of fields, the hay ready for harvesting, shady clumps of trees in Petworth Park and downland farms tucked into the hills. Another favourite subject is the Ile de Ré, where he spends much of the summer. His spontaneous landscapes painted directly from life and developed in the studio, edge towards abstraction. Broad flat brushstrokes define space combined with a strong sense of draughtsmanship and subtle colour sense. He has exhibited work at The Royal Academy, The National Portrait Gallery, The Royal Festival Hall, The South Bank Centre, The Royal College of Art and many other galleries.